Jean (Mitzi Rogers) rushes into work at Anderson's Small Arms; Miss Ellis (Judy Parfitt) arrives and chastises her for being late and tells her to transcribe Mr Anderson's dictations from last night. She starts the tape and Anderson's voice announces he is opposed to the takeover bid by Henry Cade Holdings; she realises she hasn't any paper, so goes into the office to get some. She knocks a pile of paper off the top of a cupboard, picks it up, and finds a pistol on the floor - and Mr Anderson's body - then she frantically calls Miss Ellis. 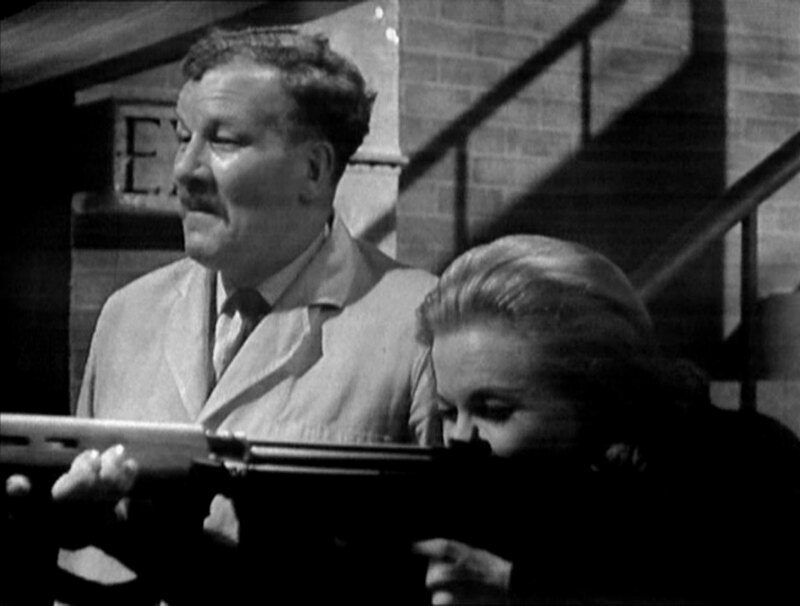 A while later Brigadier Williamson (Charles Carson) is testing a revolver with George (Robin Wentworth) in the butts. Miss Ellis comes to tell him to attend the board meeting in five minutes and reveals there are a few unknowns amongst the shareholders. "Stooges from Cade no doubt", he grumbles, then follows her out, telling George to "keep the gun aside, I may need it again". One of the shareholders (Graeme Bruce) asks Reynolds (John Frawley), the vice-chairman, whether Mr Anderson's suicide was related to the Cade takeover bid. Reynolds retorts that all the directors were opposed to the bid. Cathy rises and asks a probing question about the accounts showing an increase of over £100,000 in labour and material costs over the last year. The works manager, Young (Felix Deebank), declares this is an accurate reflection of rising costs, causing uproar, and the first shareholder proposes a resolution to elect Cathy to the board as 'she's the only one who knows what she's talking about'. The resolution is passed, only Young among the directors voting in its favour. They adjourn for lunch and Cathy meets Steed outside, thanking him for his planted firebrand and for shelling out £50,000 for the shares. He tells her he bought when the market was low and had already made a profit so offers her a gull's egg in celebration, a pistol hidden in the box. She recognises it as British Army standard issue and is told they come in all sort of packages - gifts and food relief to refugees - a steady stream of mint condition British made guns going out across Africa from Tangiers; it must be stopped before there's a full-blown tribal war. The chairman's suspicious death made Anderson's a good starting place - and Steed notices one of the shareholders eavesdropping... He tells Cathy to find out why Cade is interested and to hold onto those eggs until they hatch. Henry Cade (Ronald Radd) is on the phone, ticker tape in hand, telling his broker to keep buying. His intercom buzzes and the receptionist announces a Miss Grey from "Woman about London". His 'phone rings just as she's entering and he tells the caller to make a further offer to Anderson's shareholders. Miss Grey enters - Cathy, of course - and is given six minutes for an interview. She starts asking him about being a self-made man and his décor and he gives her a few minutes less. He describes his taste in décor as 'vulgar' and she says he's very frank and straightforward. "No", he says, "I'm cunning and devious". She asks him what his interest in Anderson's is and he says he intends to buy it up, reorganise finances and sell it for a profit. He bought the magazine last month - if she worked for him she'd know he didn't talk to reporters. She smiles and says he thought he'd be more likely to see her if he knew she were phoney. He says, "Mrs Gale, I let you up here because you own 20% of Anderson's stock". He tells her it can be a rough business and she'd be advised to sell her stock before she gets her fingers burnt. He then places a call to Mr Reynolds at Anderson's. At Anderson's, Young comes in looking for Reynolds but when he hears he's not there he fondles and kisses Jean. She admonishes him happily and tells him the Brigadier thought Mrs Gale was a spy for Cade. Miss Ellis enters and tells her not to talk rubbish, and tells Young that Mrs Gale is in the butts, getting acquainted with the technical side of the business - which alarms Young. Cathy puts a few rounds from an Armalite into the bullseye, pleasing George no end. They go to check her card, George approving of the grouping of the bullet holes, and then discover Reynold's body when he reaches for a replacement. 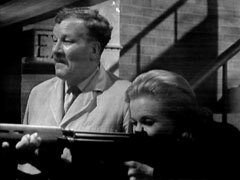 A police inspector arrives and ascertains that George wasn't there when Cathy started firing the rifle but almost anyone could have guessed Mr Reynolds might be in the butts. 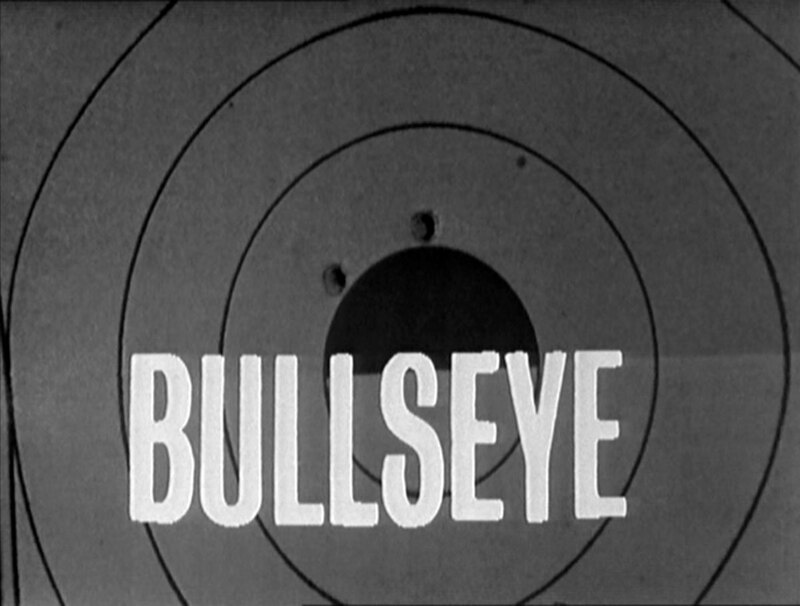 George leaves and the inspector tells Cathy that every bullet in Reynolds' body came from the rifle she fired and the only prints on the rifle are hers. The Brigadier is annoyed to hear Mrs Gale is under suspicion, telling Young and Ellis that Cade is the obvious culprit and paid someone to do it. Miss Ellis suggests Cathy bought her 20% holding with Cade's money and the Brigadier agrees he had thought so but has changed his mind. He's determined to stop Cade getting control of the company and Miss Ellis says she thinks they can't stop him anymore, now that Reynolds' and Anderson's controlling interests have gone. They're startled to learn that the Brigadier has bought all of Anderson's holding from his widow, and has the first option on Reynolds'. "We're back where we started! ", she exclaims. "If Cade wants to take over this company, he's got to get rid of me! ", the Brigadier barks, leading Young to comment that puts him in a vulnerable position. 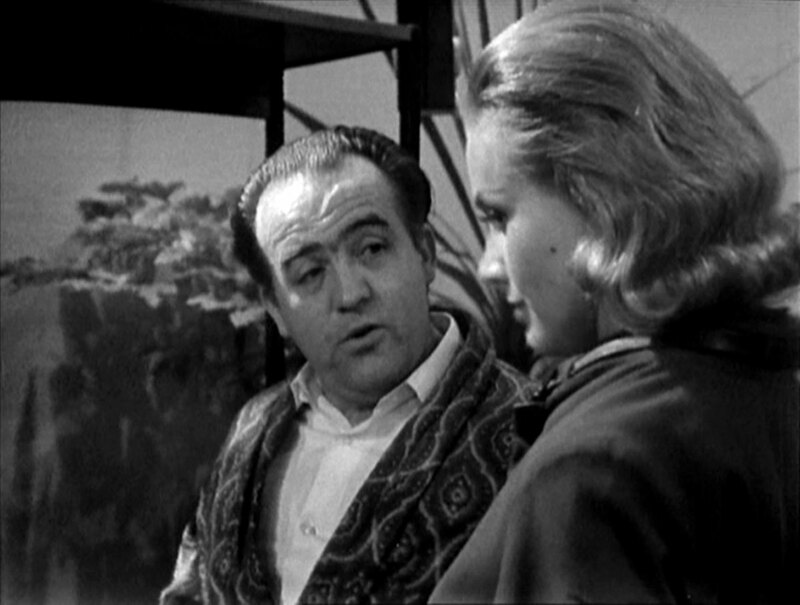 Steed meets Cathy and she confirms Anderson's makes all the weapons on the black market, but can't guarantee it's the source as there are no maker's marks. All the weapons are accounted for - on paper, at least; they made a trading loss last year so shipments may be being lost along the line. Steed shows her a photo of a man who'd been shadowing her and snooping around her flat. She says he was at the shareholders' meeting. Steed annoys Cathy by telling her that while at her flat he told the police she'd gone to the Isle of Wight and had told Young that she'd join him for drinks that night on his houseboat. At the houseboat, Jean finishes some letters and prepares to leave, saying she has a date with a policeman. Young says she can do better than that but she fights him off, screams, and bites his hand when he tries to silence her. Admonished, he escorts her back to the office and when they leave Cathy slips on board. 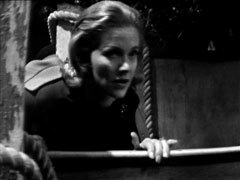 She's searching the cabin when her shadow, Karl (Bernard Kay), tries to grab her and he's wrestled to the ground by the time Mrs Young (Laurie Leigh) appears on the companion ladder. Cade visits the Brigadier at the office and offers him 43/- for each share to buy him out, and will put him on a retirement pension of £25,000 p.a. once he has control of the company and offers a hand to shake. Back at the houseboat, Dorothy Young is going out on a date with Karl, telling her husband not to wait up, and apologises to Cathy, saying they thought the boat was being burgled. She insinuates that Young often 'works late' at the office with Jean. After they leave Young offers her 45/- per share. She says the Brigadier offered 45/6 and he suggests they can go to 46/- but Cathy says Miss Ellis wouldn't like it. Young scoffs that she's just a secretary and has only been with them for a year, working in the same position for a Swiss company beforehand. Cathy jokes that if she holds on long enough someone will offer her £3 and Young tells if she waits too long she'll get a bullet in the head. Just then, Jean rings tearfully from the office to announce that the Brigadier has been shot dead. On the desk are the Brigadier's revolver and Cade's half-burnt cheroot. Young phones the police and Cathy grimly observes, "And now we are three" after slipping a handkerchief out of the dead man's hand. The next morning, Miss Ellis sends Jean home after the inspector has finished questioning her. She tells Young and Cathy they'll hold the shareholders' meeting that afternoon as planned, the death making Cathy's holding controlling. Cade rings and Cathy astounds Young and Ellis by agreeing to see him. Cade then learns that Anderson's ordinaries have dropped 3/- overnight but he keeps buying. Cathy arrives and Cade kindly offers her last night's closing price, despite them now dropping further to 35/6 each. He reveals an idealistic streak, saying three men who lived off the profits of armaments have died from their use. Young meanwhile is being pressured by Karl to steal more rifles, despite the increased scrutiny. He complains about Karl's poor attempt to stifle Cade's takeover, not sure that Cathy won't sell to him. He concedes he'll get the rifles taken to the butts for final testing but has to be at the shareholder's meeting, so Karl will have to be at the boat to handle the transport. Karl says he'll handle everything else, including Mrs Gale. Young is late to the meeting and tells Karl everything's ready for him on the way in. Cathy makes her report on the company, advocating a change of management and causing great uproar as they realise she's sold out; Cade appears and confirms he now holds 61% ordinaries and 23% preferential. Young is outraged and registers his protest and offers his resignation. Cade calmly tells him to leave, closes the meeting, and orders Miss Ellis to make a complete inventory down to the last paperclip by nine in the morning. Karl is stacking rifles in the boat and refuses to let Young return them to the store. He intends to go downstream without lights after nightfall, they steam straight for Brittany. Young goes to fetch Dorothy, while in the butts Cathy and Miss Ellis are stocktaking, much to George's amazement. He leaves a rifle behind that he's just ascertained contains four shells and departs. Miss Ellis tells Cathy she's let everyone down badly and she should have told them she'd sold out. Cathy says that would have been suicidal and produces the handkerchief she found in the Brigadier's hand, showing it has Miss Ellis' lipstick on it. Cathy says she's the only one who could have got close enough to the Brigadier and Anderson without their suspecting, and she probably followed Reynolds quietly into the butts and when he checked the target she struck. Cathy wanders towards the target and Miss Ellis puts on her gloves; when Cathy turns to face her, she has the rifle in her hands. Cathy says she is of course an excellent markswoman, Karl teaching her while in Switzerland. 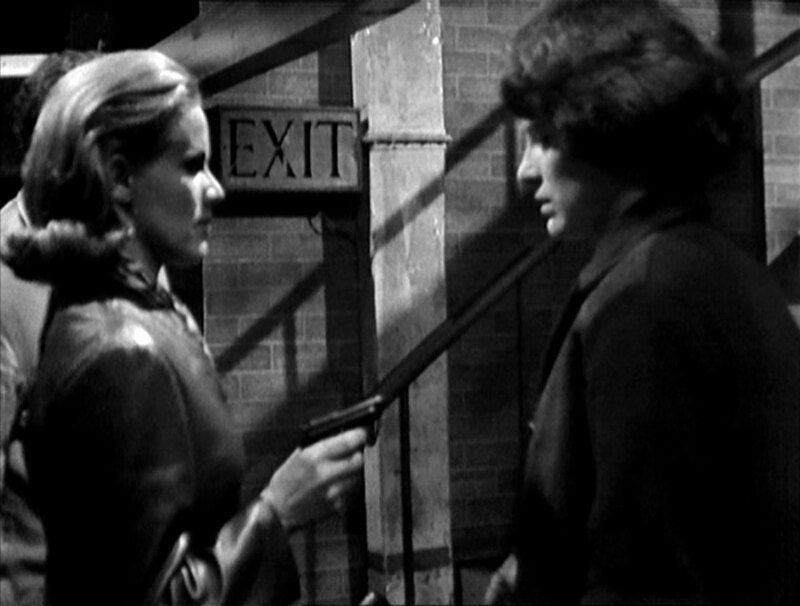 Cathy reveals that Karl has betrayed her, leaving for Africa with Dorothy, and she discharges three shots at Cathy. George comes down the stairs, telling her the rifle was loaded with blanks, and Cathy leads her at pistol-point up the stairs to two waiting bobbies. 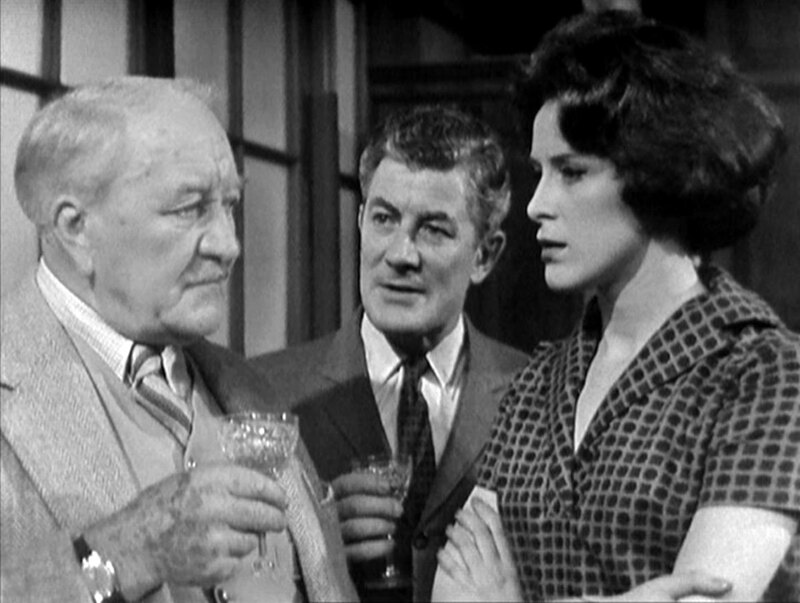 Cathy arrives at Cade's to find he and Steed are discussing finance. Cade tells her that her 'broker' is a shrewd man. She gives him the stock report and he tells her she shouldn't have bothered as he sold Anderson's last night to a Japanese consortium. Steed confirms that the river police intercepted the boat and recovered the guns and Cade asks Cathy to lunch to learn all about it; Steed says she can't as she's having lunch with him, then openly says, "You don't want to get mixed up with the likes of him. There's no knowing where you'll end up!" Cathy grins and says, "Dinner! ", giving Cade the thumbs up and he returns the words and gesture.